The Roland FP-90 packs Roland’s flagship piano sound engine and keyboard into a sleek, modern cabinet that also houses a multi-channel speaker system. If you play the piano, you understand that inspiration can come from anywhere—where you play, who you play with, and of course, the audience you perform for. If you want to take your music to the people, the Roland FP-90 Digital Piano will help you get there. It packs Roland’s flagship piano sound engine and keyboard into a sleek, modern cabinet that also houses a multi-channel speaker system with enough power for performing in intimate venues. 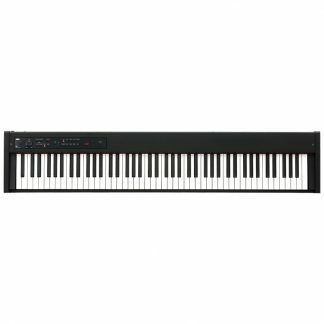 A carefully selected range of additional sounds that include electric pianos, strings, organs, and synths are on hand as well, allowing you to use the FP-90 in a wide variety of musical scenarios. And with Bluetooth audio/MIDI support, you’re able to connect wirelessly with Roland’s Piano Partner 2 and other music apps on a smartphone or tablet. Authentic grand piano touch from the PHA-50 (Progressive Hammer Action with Escapement) keyboard, which combines wood and moulded materials for great feel and lasting durability.